Texas Commissioner of Education Mike Morath paid a quick visit to the Rio Grande Valley to talk about changes to the STAAR Report Card aimed at increasing parent engagement. 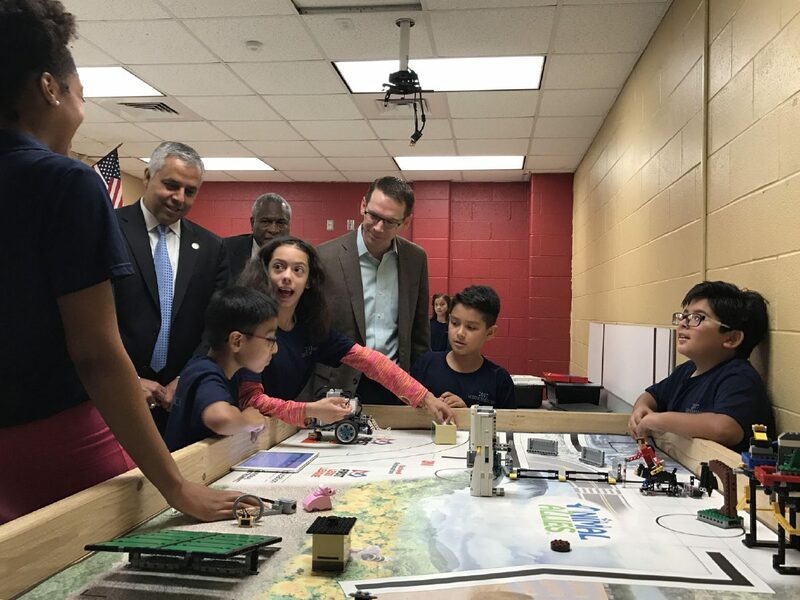 HARLINGEN — Dozens of smiling students at Gutierrez Middle School in Harlingen greeted Texas Education Commissioner Mike Morath on Thursday and briefly showed off their knowledge of robotics and coding. 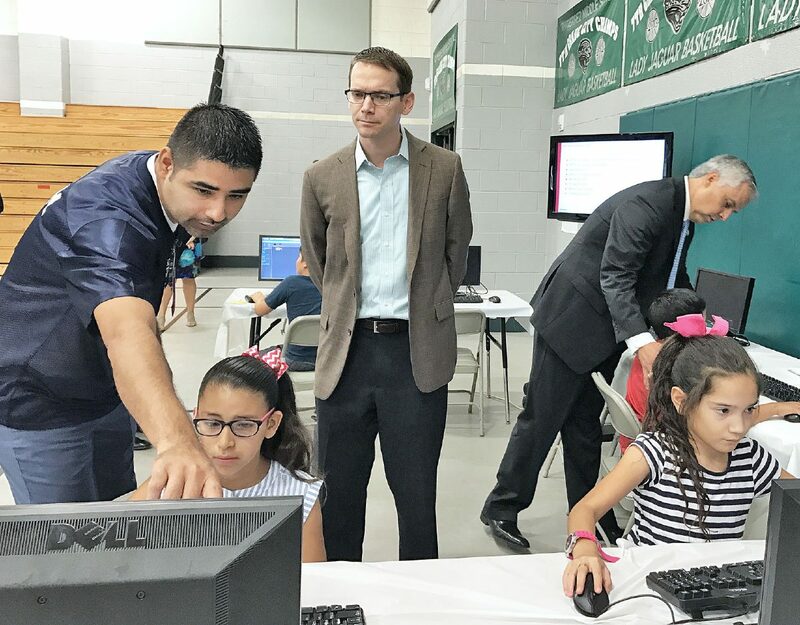 Morath paid a quick visit to the Rio Grande Valley to talk about changes to the new report card for third- to 12th- graders taking the State of Texas Assessments of Academic Readiness exam, or STAAR. The new report card is aimed at increasing parent engagement. High school report cards have already been mailed out, he said, but the ones for third to eighth grade will become available on June 30. All of the information provided is available in English and Spanish including the physical report cards and additional resources at texasassessment.com. Texas Commissioner of Education Mike Morath paid a quick visit to the Rio Grande Valley to talk about changes to the STAAR Report Card aimed at increasing parent engagement. He is seen with students at a visit to Harlingen schools. The Texas Education Agency revamped the report cards to allow parents to not only see their child’s score on the annual evaluation and online resources where they can even access to the questions asked and see what their child answered correctly, incorrectly and an explanation of why the question was important. The new report cards provide context in each of the aforementioned subject areas, plus science, for third to eighth grades, and English, Algebra I, Biology, English II and U.S. History for ninth to 12 th grades. These will include overall scores, achievement percentile compared to statewide scores in each area, and a comparison to the previous year’s scores. The student’s scores will be classified as passing if they master grade-level knowledge, meet grade level, or approach grade level. The only non-passing grade will be categorized as does not meet grade level. This individualized information is also available for teachers so that they can communicate with parents the specific needs of each child in the subject areas. The new cards have been in the making for over a year, he explained, and were developed after conducting several meetings and focus groups with parents and other stakeholders across the state. The hope is that by improving access to parents, they will also be able to better understand the exam and the progress that their child is making. “The STAAR test is a bit of a foreign concept for a lot of people, but each of the questions that are asked on the assessment is aligned to curriculum that is taught during the school year,” he said. When looking at their child’s information on the state website, parents will also have access to additional resources such as suggested books based on the student’s reading abilities and goals. Being that this is the first year that parents will have access to these tools, Morath said more focus groups will be conducted to see what needs to change or improve for the upcoming years.